Mesa has the Valley Metro Rail, so what's it good for? At first, you might not think much, because it may not go anywhere near to where you work. But there are some very interesting things you can do on the metro light rail. You can park your car for the day at one of the many park-and-ride lots of the Metro. These are for day use only. Here's a list of the locations of the free Metro park-and-ride lots: park-and-ride locations. It is comfortable, modern and moves along at a good speed similar to regular traffic. Seats are basic cloth covered and there is room for things like strollers and even bicycles! Wheelchairs are no problem because the level of the landing and train looked good, and the gap was very small. Also there are places for wheelchairs. The Metro is smooth as glass; you will notice this is not some crazy swaying, jerking, smoky bus. The Valley Metro Rail is a fun thing to do with friends and relatives when they come to town and want to see what some parts of area look like. You will see major Tempe and Phoenix attractions, mixed in with a few bland commercial areas. The train moves at a fast speed and will get where you want to go quickly. It is nice and new. So far there is no graffiti. You can get from Mesa to the other end in Phoenix in about an hour and 15 minutes on a busy weekend. The Valley Metro Light Rail is equipped with room for your bicycles. Just wheel them in the door and find the place to hang your bike on a bicycle hook. If the bike is too heavy to lift up on a hook or they are full, a lot of people just hang on to their bikes on the floor. Think of the rides you can take around the scenic Tempe Town Lake! 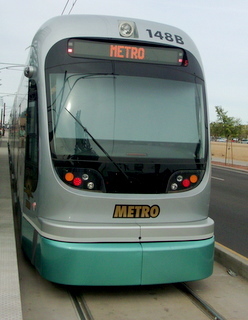 A lot of ASU students use the metro light rail to get to and from the campus. It's convenient and healthy to be outdoors during the good weather months. Save money on parking fees too. Tired of the parking hassles and choked traffic in Tempe? Take the Metro Rail and get off near Mill Avenue for attractions like the now closed Monte's la Casa Vieja etc. The Phoenix downtown is a great place to see and visit. Especially if you don't have to drive there. There are attractions and museums concentrated within walking distance. For example, check out the Wells Fargo History Museum, or the Phoenix Police Museum. Walk through the ancient grounds of the Pueblo Grande Museum. Just north of downtown is the Phoenix Art Museum. Another must-see museum is the Arizona Science Center. Step off the Valley Metro Rail anywhere and get a bite to eat. Then when you go back to the station, a new train will be there. They generally come every 10-20 minutes depending on day of the week and time of day. Ok, so you might have to walk a couple blocks in the heat. But even if you park in the covered parking lots you have to walk a ways too. Then with the money you saved on not hassling for parking you can get an extra dog and drink! 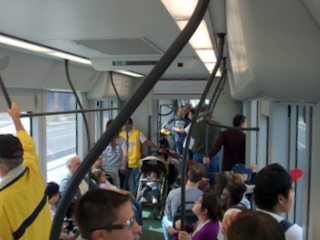 This part of the Valley Metro Rail is divided eastbound and westbound because of the one-way streets. The Metro follows the one-way streets. So depending on which direction you want to go, you have to walk north or west a block to catch the train around 3rd St.
For example, if you are traveling from the east valley you will go past the Science Center, Phoenix Civic Center and get off at the station just below the Phoenix Symphony Hall. Walk south a block and then east a block. It is hard to get lost because the stadium is a huge landmark. Then to return to the east valley you will leave the north end of the baseball stadium and walk west a block. Do you flinch when you need a ride to the airport because of the sometimes crazy traffic and confusing road signs? Well take the train next time! Just get dropped off at your local train station. Here is how it works. The Sky Train actually goes to Terminal 4 at the airport, with shuttle bus service to the other terminals 2 and 3. So the Metro train will stop in a nondescript commercial area just north of the airport. It is next to a transfer depot that will whisk you and your luggage to wherever you need to go at the airport, see the Sky Harbor rail and bus map: Metro Light Rail to the Airport. The Sky Train runs All the time so you won’t have to wait long, maybe 3 or 4 minutes. Add this to your total trip time. Best advice is pack light and use luggage that rolls because you have to hoof it a ways. I did see a guy on the metro with a large carry on and he said it was still more preferable than asking a friend to drop him off at the airport. Be sure to check for any changes because Valley Metro Rail train schedules are subject to change without notice. The schedule shows different start times M-F or the weekends. Here’s the general schedule page so please check for any time changes before your trip: Metro Rail Schedules. If you want a paper printed copy of the Transit Book, you should be able to get them at all major transit centers, libraries and city hall offices. Or just print what you need from the transit website and it will probably be more current.